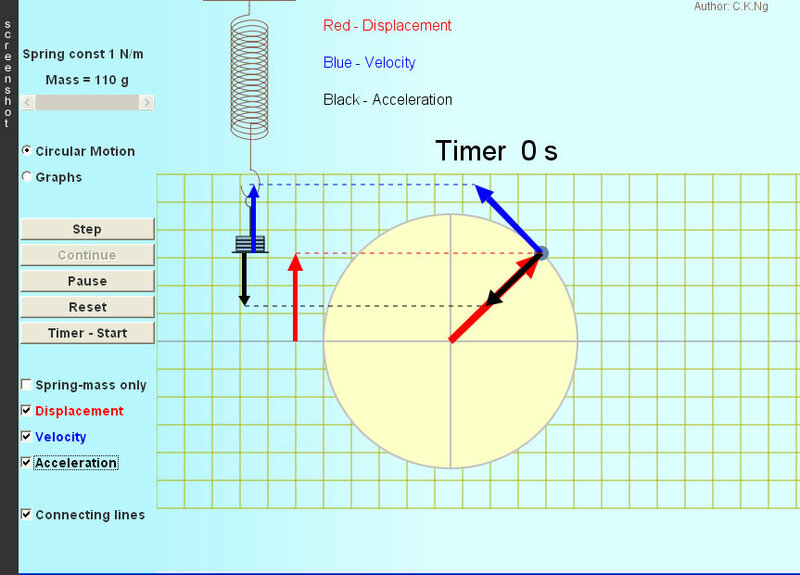 To begin an oscillation, drag the block up or down and then release. The periodic motion of the block is simple harmonic because the acceleration is always proportional, but opposite to the displacement from the equilibrium position (definition of SHM). It is identical to the projection of a uniform circular motion on an axis. The curves (x-t, v-t and a-t) are sinusoidal with acceleration leading velocity by π/2 and velocity leading displacement by π/2. 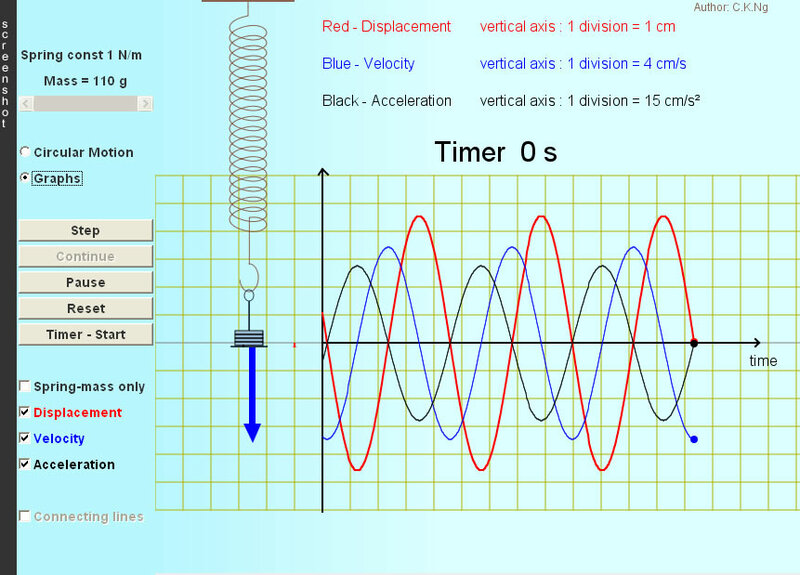 The period of oscillation is independent of amplitude (isochronism). Suppose a particle P rotating anticlockwise with radius A and angular frequency ω. 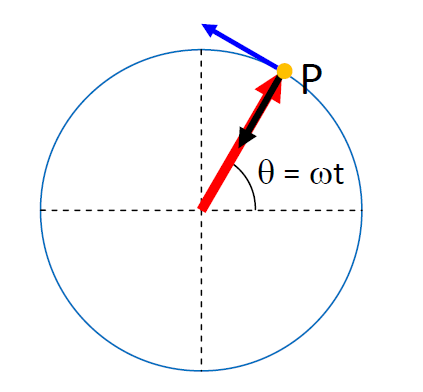 Of P, the displacement from the center of circle, the tangential velocity (ωA) and the centripetal acceleration (ω2A) are represented, respectively, by the red, blue, and black vectors in the above figures. A SHM can be regarded as an axis-projection of a uniform circular motion. 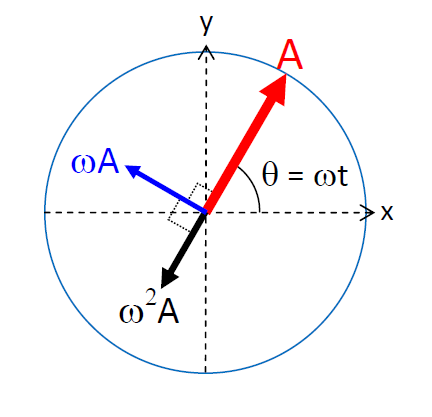 In shm, the amplitudes of displacement, velocity and acceleration are A, ωA and ω2A respectively. Phase Differences: a leads v by π/2 ; v leads displacement by π/2.